Includes: three-course dinner, silent auction, and time to meet the authors and have books signed. Quentin Tarantino has been nominated for 21 Academy Award in various categories and 20 Golden Globes. He won Academy Awards and Golden Globes for Best Original Screenplay for Pulp Fiction and Django Unchained. This Knoxville native’s success started in 1992 when his powerful film, Reservoir Dogs, dazzled audiences at the Sundance Film Festival. Quentin has recently had his hand in some smaller foreign films and given them attention that they would not have been able to get without him. Aside from being born in Knoxville, Tarantino’s love for film was began at the South Clinton Drive-in back in 1973 when he was just a child. Mark W. Schaefer is an author, top-rated instructor, and internationally recognized blogger and marketing consultant. With 30 years of experience in sales, public relations, marketing, and eCommerce Mark is without a doubt qualified for his position as Executive Director of Schaefer Marketing Solutions LLC as well as being an adjunct marketing professor at Rutgers University MBA Program. His book, The Tao of Twitter, is among the top 50 internet marketing book of the year and top five business communication books on Amazon. Mark is an internationally-known marketing consultant and has appeared in The Wall Street Journal, Wired, Entrepreneur, The New York Times, The London Daily Mail, CBS News, and countless others. Schaefer has also been named by Forbes magazine as one of the Top 50 Social Media “Power Influencers” in the world. Karl Edward Wagner was an award winning writer, editor, publisher and columnist. For 15 years Wagner edited DAW Books’ annual anthology, “The Year’s Best Horror Stories”. Some of his major honors include receiving the World Fantasy Award twice, the British Fantasy Award twice, and the Phoenix Award for Science Fiction. The British Fantasy Society now offers a special award named in his honor. Even 19 years after his death, Wagner continues to have a worldwide following. Arthur Stewart, is a 1997 Tennessee Poetry Prize winner. Stewart’s poems have been published in more than a dozen national and regional poetry anthologies, many literary magazines, and many scientific magazines, including the Journal of the American Medical Association, the Bulletin of the Ecological Society of America, and Chemical & Engineering News. 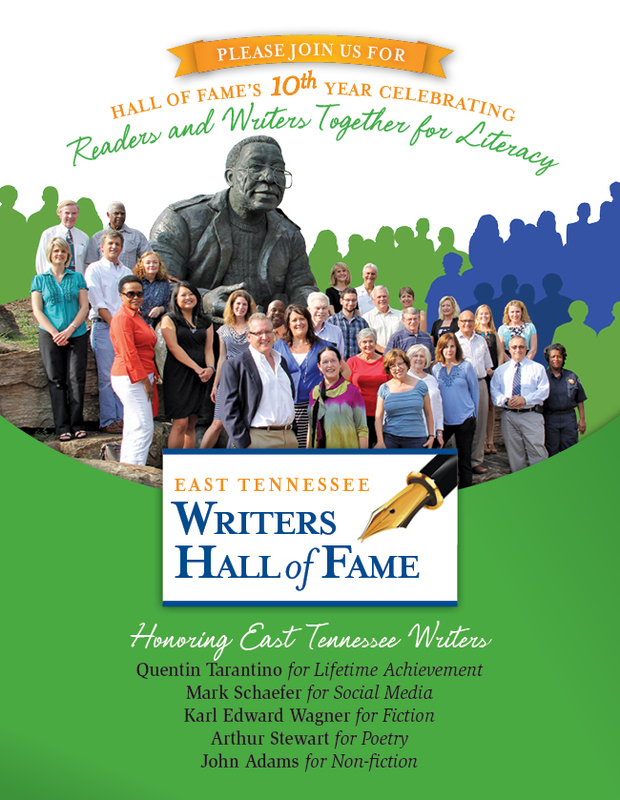 He has earned awards in multiple annual writing competitions held by the Knoxville Writers’ Guild. Arthur has also been awarded the 2009 Wilma Dykeman Prize for essay writing. John Adams is the well-known sports writer for the Knoxville News Sentinel and has been named sportswriter of the year in Tennessee six times. Adams began writing for The Watchman weekly newspaper back in Clinton, Louisiana when he was only 15. By the time he was 19 he was editor of the paper. He has been named sportswriter of the year in three different states: Louisiana, Mississippi, and Tennessee in addition to having the Sports Story of the Year in Pennsylvania. John has worked for the News Sentinel for over 25 years.